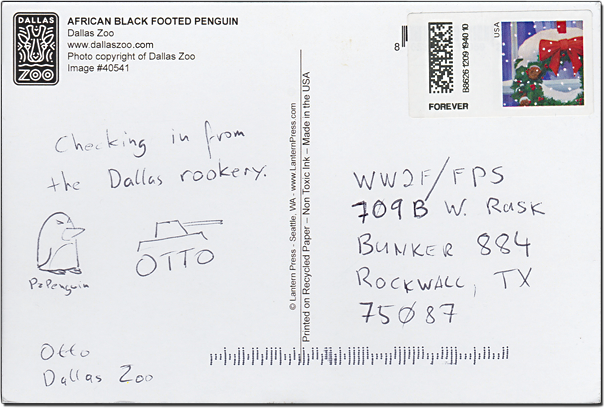 Discussion in 'WW2 Forums/Forces Postal Service' started by Otto, Mar 13, 2019. 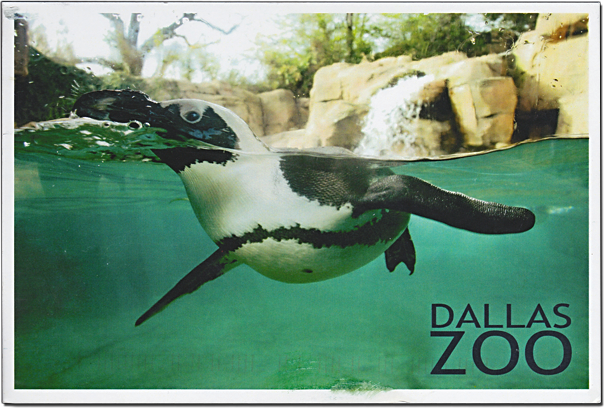 This past Sunday the family spent the day at the Dallas Zoo, and sent in a field report. As a dutiful Rogue, I made an obligatory stop at the Penguin exhibit to pay my respects. There are eight African Penguins housed in an hybrid water/land enclosure that gives visitors the ability to see the Penguins as they dive into the water and swim beneath the surface. They are really quite active and have a good amount of space to roam and swim. For some reason I really get irked when I visit a zoo and see animals in a cramped enclosure. Clearly the size of this enclosure did not generate that response, as their home is really quite large. The photo here is a small portion of their home. Thankfully, there was at least an image of a Fairy Penguin (aka a Blue Penguin), which is the species of the mighty PanzerPenguin, the mascot and defender of the WWII Forums. Some think the PanzerPenguin has been absent from the site, but he is always lurking, always watching, and ready to strike. Remember to check the WW2 Forums/Forces Postal Service Map for a look at our growing list of all WW2F/FPS submissions. The_Historian, OpanaPointer, PzJgr and 3 others like this. Luv the little Aussie Fairy penguin! I wonder how many Americans know penguins are only found in the southern oceans..? Otto and OpanaPointer like this. Make your way down South to San Antonio. Their zoo was my go to place for relaxation. I loved going there. Seems always cooler temp wise so nice to hang out during the Summer. Where are the guns and bombs? Plucky little bastards aren't they? Never liked petrels either, most of them are into "What if?" and alternate history. I checked their website, sadly no Penguins of any sort. It will be hard to recruit troops for the PanzerPenguin if they don't have penguins. I might send them an email requesting they get a few to support the cause. I second PzJgr's suggestion! San Antonio has (or had last time I was there) an excellent zoo. Thake the wife and stay over night. Take her to the Riverwalk, great atmosphere, great food, good music, good drink! Take the kiddo to the Alamo, make him a true Texan! It can make for a great weekend trip. Can the penguins read those hand signs? I used to think Warm Weather was bad for Penguins, but it turns out quite a few species like warm weather and one even hangs out in a Jungle! My wife called into the San Antonio Zoo to confirm. Sorrily no penguins. I'm not sure how they expect to handle enemy incursions without at least a platoon on penguins on hand. They are especially vulnerable to amphibious assaults. Most species of penguin live south of the equator, but one naturally lives north of it, the Galapagos Penguin. I won a trivia contest in college because of this fact. My obsession with penguins pays dividends again and again. edit- pretty sure that was a fail . cest la vie.